As a search of this site under the composer's name will reveal Gossec has not been ignored. This reissued disc further establishes and enhances his standing. It would be easy to spoil Gossec with a heavy flat-footed approach. That is not what he is treated to across these four symphonies. Take the Symphonie à grand orchestra "La Chasse". It's full of rhythmic surprises along the way as in the lively first movement which sounds Beethovenian. The skilled Concerto Köln under Werner Ehrhardt search out its serene dignity. The progress of this music reminded me of another neglected French contemporary figure: Etienne Méhul. Pre-echoes of Beethoven - this time The Pastoral - return in the delightful countryside finale of La Chasse. The Allegro of the "Mirza" Symphonie concertante - a work with solos for violin and flute - is Mozartean. Its invention is gracious and even doffs its hat in the direction of Mozart's K364. None of these symphonies is long-winded. The two central works, each in three movements, are exceptionally compact while remaining gently amiable. This affable geniality is even sufficient to lift the spirits in the fugal finale of the Sinfonia à piú stromenti. 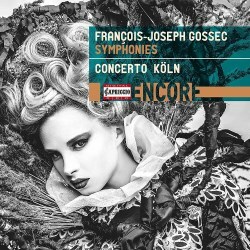 The disc ends with the most grand and Beethovenian of these works and also the latest: the Symphonie à 17 parties. It returns to the four-movement schema. Not quite as fresh as its companions it still sports a witty and youthful third movement harking back to Gossec's earlier years. Gossec rounds things out with a regal finale. While the note in English only by Michael Stegemann is pretty brief it serves its scene-establishing purpose rather well. This lively music heard in lively music-making. It draws on an amiable personality who mines both serene dignity and regal grace.